Growing strawberries in your home garden will provide you with a bounty of sweet tasting fruit fairly quickly, with minimal maintenance and little space. 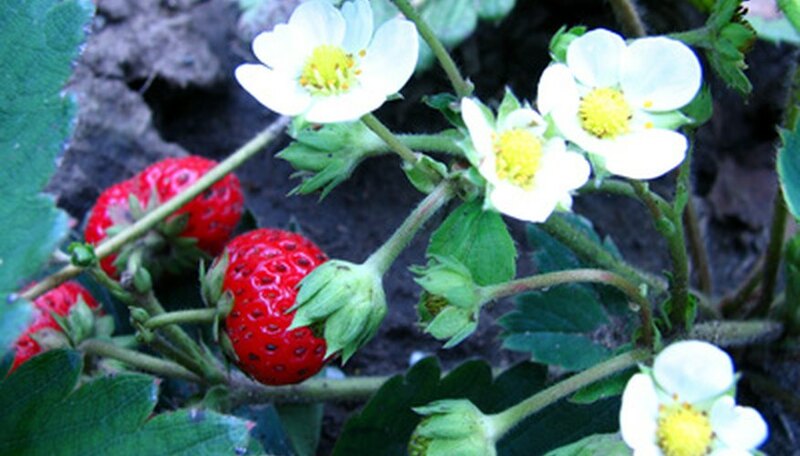 The most difficult task in growing strawberries is weed control in your berry patch. Planting and growing strawberries with plastic mulch will conserve water, reduce the use of herbicides for weed control, and keep your berries clean. Large strawberry producers have been using plastic mulch successfully for years. Prepare the soil and area where you are going to grow strawberries. It should be in a sunny location with well-draining, loamy and fertile soil. Remove or kill any weeds growing in the area and work a pre-emergent weed killer product into the soil. This will inhibit the germination of future weed seeds. Build up raised rows of earth, 8 inches high and 12 to 24 inches wide. Roll out the plastic mulch, starting at one end and rolling it out the length of the row. Add an extra 1 foot, or more, at each end for complete coverage. Spread the plastic mulch out so it is a single layer and is centered along the row. Secure the mulch to the ground with earth staples, U shaped wire or weights, like rocks or bricks. Place the staples, wire or weights every 2 to 3 feet down the row, on both sides. This keeps it flat and ensures that wind and animals cannot move the plastic mulch. Slice an X, with a sharp knife, through the plastic mulch at one end of the row. Each slice should be 6 to 8 inches long. Measure 12 to 18 inches down the raised row and make an X for the next strawberry plant. Continue this down the entire row. Peel back the plastic of the X and, using a hand trowel, dig a hole large enough to accommodate the roots of the strawberry plant. Sit the strawberry plant in the center of the hole with the crown, where roots and leaves meet, at the soil surface. Fill around the strawberry plant with soil, gently, but firmly, tapping down loose soil to eliminate air pockets. Move down the row, planting all the strawberries. Water the strawberries thoroughly after you have completed planting. Day-neutral and everbearing type strawberry plants produce fewer runners than June bearing plants and are ideal for plastic mulch. Use drip irrigation, either under or over the plastic mulch. Underneath the plastic may encourage weed growth more than placing the irrigation above the mulch. Monitor the spots in the plastic mulch where you planted your strawberries for weeds appearing close to the plants. Hardier weeds will still germinate and grow where they can. Hand pull any weeds you find.